COSF has three integrated programs, a comprehensive case coordination program, a collaborative network program, and a supporting education and engagement program. COSF's team oftrained case coordinators and veteran peer navigators provide personalized, holistic long-term assistance to struggling service members, veterans and their families (SMVF). We serve all generations across the nation, regardless of discharge status. PATRIOTlink, is a cloud-based resource navigation platform designed by service providers for service providers. The strategically populated provider assistance tool empowers service providers to easily navigate and find resources for the service members, veterans and families they are assisting. This allows a service provider to perform searches that result in resources their client qualifies for, significantly reducing the amount of time it takes to find the often multiple resources their client needs. COSF works to build America’s public awareness of the service and sacrifice of our SMVF through its education and engagement program. Most people want to help but they don’t know how. COSF provides engagement opportunities using a variety of platforms to move civilians from caring, to committed and involved. 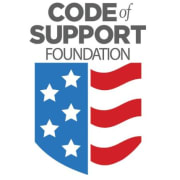 Would you recommend Code of Support Foundation?